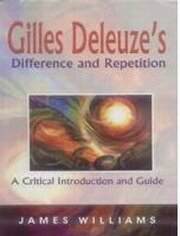 This is the first critical introduction to Difference and Repetition, Gilles Deleuze's most important work of philosophy and one of the most significant texts of contemporary philosophy. In offering a critical analysis of Deleuze's methods, principles and arguments, the book enables readers to engage with the revolutionary core of Deleuze's philosophy and take up favourable or critical positions with respect to its most innovative and controversial ideas. The book will also help to extend Deleuze's work to philosophers working in the analytic tradition.